Shamans Through Time, by Jeremy Narby & Francis Huxley, is the 'About an Indigenous culture/Non-western history' selection for my 2016 (Blended) Reading Challenge. There are tons of glowing 4- and 5-star reviews on this one, and I guess I'm the odd one out, because I (to my surprise) did not enjoy this much at all. 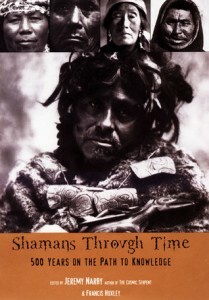 It's a collection of essays throughout the ages about shamanism – but all from outsiders' points of view. It was an especially hard read because it goes chronologically, and essays from the 1500s right up to about the 1950s or so all denigrate the topic and approach it with such disdain and cluelessness. It taught me nothing except how assholish and self-aggrandizing people can be. We actually start to learn and gain some great insight once we see essays from people who actually respected the topic and/or participated in shamanic practices themselves. Unfortunately, we don't see any of that until nearly the end of the book. This might be great for historians or academics, but if you're actually interested in insight into shamanic practices, there are better books out there.